What a shame ! 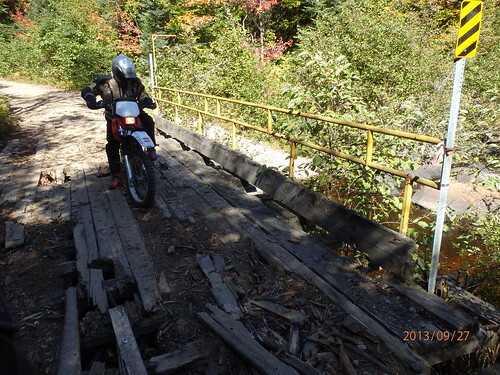 Hopefully, we'll see that trail back open next year. I wonder why? Paudash was able to use 1 to cross Eel's Creek north of Aplsey on E107 2 years ago (had to get MNR approval). The bloody things were designed to support a Sherman tank! Maybe. But not a Yamaha ! I was told that it was actually the Ministry of Labour that decided the bridge was not up to standard. Kind of sounds like there was a complaint from somebody about it. Most enforcement is a result of complaints. What does the MOL have to do with a Bridge? They need to GTFOD! It is possible that a groomer operator who is paid and therefore an employee could file a complaint with the MOL under the Occupational Health & Safety Act that he is required to drive a groomer across a bridge that he feels isn't safe. Or perhaps someone with a grudge against the club. Maybe a former groomer operator. It was NOT the Minisrty of Labour - it was the MNR and they were responsible for the bridge being removed. 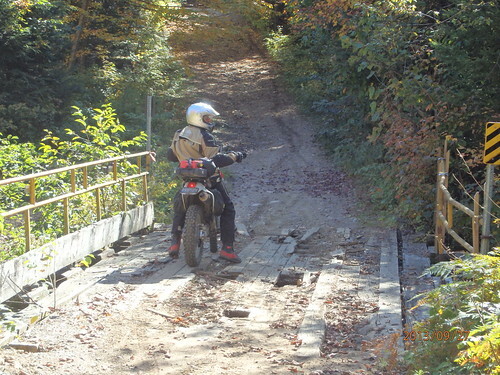 Im guessing this is the one, we ride this trail(old Wagon road) on our fall ride every year, these were from 2013 and it looked pretty tough then. Pic.s stole from riding partner. Bummer I loved this trail too. I have rechecked my original source, and spoken with DWITGH RX. It turns out that the MNR and MOL were both involved in closing the bridge.